What would you if you encountered a traumatic event where someone was bleeding and no medical professional was immediately available? Jamaica Hospital’s Trauma Division wants to make you aware of a national campaign called “Stop the Bleed” that can help in these types of situations. Uncontrolled bleeding is the number one cause of preventable death from trauma. 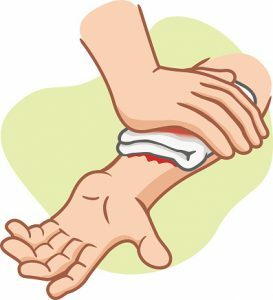 Stop the Bleed is a national awareness campaign that was initiated by the White House in 2015 to bring attention to this very serious situation. It is a collaboration of a number of Federal agencies, non- profit organizations and corporations. The purpose of this campaign is to teach as many people as possible what to do when faced with a bleeding emergency before professional help arrives. When an emergency arises often the first people on the scene will be non-medical professionals without much training in first aid. This campaign serves to train as many people as possible on what to do until help arrives. In addition it is important to assess the situation so that you can ensure your own safety. When it is possible, you should protect yourself from blood and blood products by using gloves and other protective gear when available. This entry was posted in Health, Home Remedy and tagged bleeding, Jamaica Hospital Medical Center, Stop the Bleed, Trauma by Andrew Rubin. Bookmark the permalink.